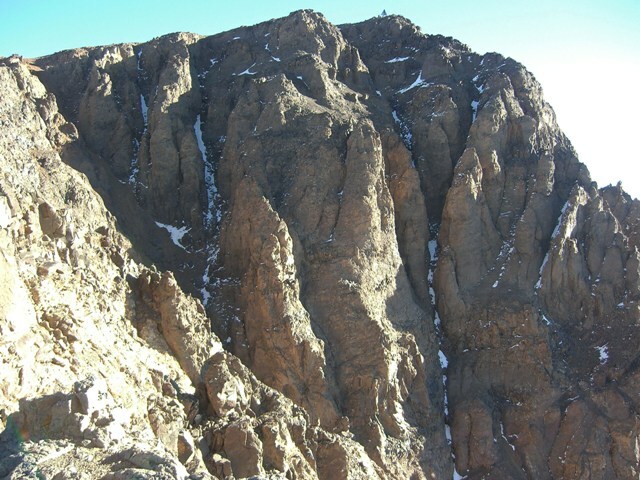 Climb north Africa's highest peak, 4,167m Jebel Toubkal. Enjoy magnificent views along the spine of the Atlas and down toward the slumbering Sahara. These are dramatic, rugged mountains, wildly broken in places, with varied and interesting flora and fauna. This is a tough walk where altitude can cause real problems. Come prepared. At the heart of the High Atlas sits Jebel Toubkal, at 4167m (13,750 ft), North Africa?s highest mountain, from which high ridges radiate toward the dry plains, nestling irrigated oasis-valleys with their mud-brick semi-fortified traditional Berber villages. These are tough, dry mountains, with sheer and broken ridges and deep valleys. This demanding 2-4 day ascent of north Africa's highest mountain starts at Imlil in a northern approach-valley, and follows a long uphill (1,467m) slog to the Toubkal Refuge with a punishing 900m ascent and descent of the peak (much of it is on a long scree slope). Consider taking two days to get to the refuge, or spend two nights there, exploring the area on the extra day, which will help the acclimatization process. The long climb from Imlil to the refuge is a fine walk, in increasingly gorgeous scenery, but exhausting as result of the long climb in increasing altitude. You will be up early for the assault on the summit. This is a dreary three hour slog, clambering over icy rock, crossing the all too aptly named Field of Boulders and zig-zagging up ramps of broken lava and an endless, imperial sized, scree slope. You get the idea. Eventually, you gain the main ridge and a majestic view north-east, across the chasm of the Tisgui valley. The final pull to the top is likely to be slow and breathless. The peak is often cold and windy, but the 360°​ views are as exciting as could be expected. 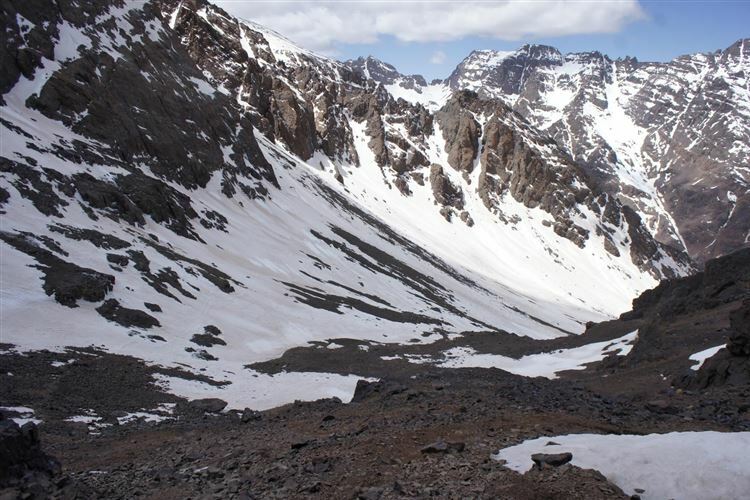 See William Mackesy's account of climbing Jekel Toubkal below. It is worth saying that the Toubkal ascent was the least enjoyable day of our wonderful Toubkhal Circuit, a cold slog after a couple of bad nights' sleep, although of course memorable for the peak-baggary and genuinely thrilling views. Some might head on down to Imlil on the same day, but that will be hard on the legs and a bit of a waste of the effort getting into the high country. Consider another night at the refuge, or you can make a wonderful day walk to the roadhead in the westerly Ouarzane valley. Start with a beautiful, gradual climb up the western side of the valley. At the Agazin pass, drink in a final view back up the valley to Toubkal. Then look across the Ouarzane valley to the sharp cliffs of the high Tazughart Plateau. A long descent down a huge scree slope, taking in some 66 (mark of The Beast) zig-zagged bends, gets you to a long, delightful walk down into rugged valleys, past a grand waterfall, through a belt of boulders and gnarled juniper trees, and past hamlets of shepherds' huts. A long traverse, as the river falls away into a deep gorge, gets you to the roadhead village of Irkoubeline, where you can stay. You can swing back to Imlil from here if you want. See William Mackesy's account of this walk below. I made a trip to Morocco last October. My aim from that trip was to climb Mt Toubkal which is the highest peak. It has been always my dream to climb a high mountain. Thanks to the proximity from France to Morocco. I made a cheap trip with a group of friends to Morocco. My trip was arranged by a local company called Toubkal Trekking ( toubkal-trekking.com). They are very reliable guys. They helped me with everything including local transport, a guide, mules for luggage, food & accommodation during the trek. It was a difficult trek at first because It's my first time trekking in high mountains. I asked the guide to acclimitize before attacking this highest mountain in North Africa. Anyways, I made it to the top in 4h walk, plus 3h downhill! It was a fantastic trip, and my aims was fulfilled!